External backup refers to copying the required data to storage media stored locally. Blurays however (recordable) are quite an affordable option for backing up larger amounts of data for long term storage. Difficult to automate – someone must be present to insert/remove discs, label, file away, etc. Long term storage requirements – cool, dry places, away from sunlight, etc. Still more expensive than other storage forms for the capacities offered and ease of use. 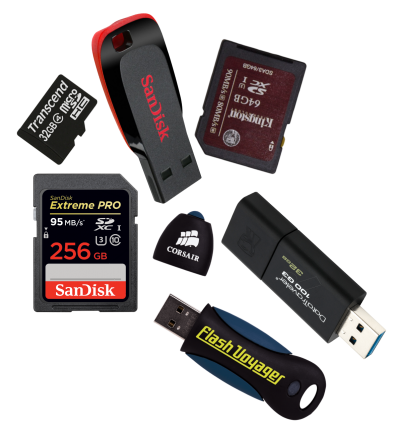 USB sticks, memory cards, thumb drives – rewritable media. Detected as secondary hard disk drive and can be used as such by automation programs. Easy to remove and store away from computer. Large capacities in small sizes. Suitable for mainly data backups. No moving parts and sturdy bodies help reduce potentials for physical damage and handle some abuse. Still relatively slow due to USB connection limitations. Data corruption could happen when disconnection/removal procedures are not followed. Cheaper drives are usually more ‘cheaply’ made thus more prone to sudden early death from sub-standard components failure. Prone to damage by power spikes/shorts. Susceptible to corruption by virus activity because they are readily accessible like hard disk drives. Limited use – back up mainly one device-source or specific data. 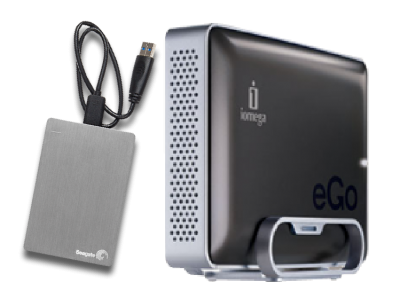 External Hard Disk Drives – connected through USB, Firewire, eSATA – sometimes called Expansion Drives. Drive inside could be either discs or flash, or combinations of both types of media. Flash is definitely faster, though with shorter life span. Desktop Hard Drives – made from desktop PC hard disk drive 3.5″ encased in an enclosure, require an external power source through an adaptor. Slightly cheaper than portable hard drives format. Portable Hard Drives – Pocket Drives – made from laptop hard disk drive 2.5″ encased in an enclosure, powered via the USB connection – best option as it would be very easy to grab and run in case of emergency, also less clutter as they do not require extra power adaptor. Price – External hard disk drives are now extremely affordable. Cost per unit of storage also very efficient and continuously improving. Good option for storing complete system image or creating bootable clone of system drive for speedy total recovery in case of failure. External Hard Disk Drives are the best option for local backup with capacities that can match the size of the system hard disk drives. Good speed, especially eSATA connected drives. External hard disk drives do die too, in a very random fashion! So not to be totally trusted. Hence one only backup will not be good enough. Fragile, will take very little physical abuse (dropping, shock, etc), extreme handling care required especially whilst running. Environment (heat, vibration, dust, etc) can easily affect performance and longevity. Connection wires can be abused, suffer decay from use or poor quality. Susceptible to power spikes, shorts (power protection recommended for valuable data – UPS, surge protection, filters). Although these could be used for cloning, performance would be relatively poor if used as active operating system drive when connected via USB or firewire. Susceptible to virus activities, accidental deletion, corruption-overwritting, etc. Potential data corruption when proper disconnection procedures are not followed. Multiple device backup requires relocating to each device in turn.